One of the perks of working at Denman is that staff get to do a course every year. You may ask, ‘how are you even able to pick just one course from the hundreds that we offer?’… and it is a hard task! 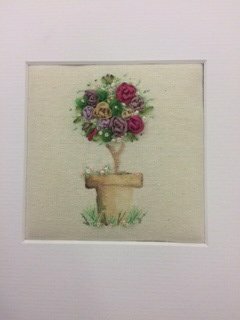 One piece of work that I kept seeing in the teaching centre kept catching my eye; a beautiful topiary tree in silk ribbon embroidery made by the wonderful Marilyn Pipe. You can only imagine my elation when a place became available on Marilyn’s ‘Roses and Alliums’ course, I immediately jumped at the chance to become one of her students, and booked my place. Upon arriving in the classroom on the first full day, Marilyn demonstrated the stitches and luckily repeated them for those of us who were new and inexperienced! It was then time to branch out on our own, terrified but determined to create something as beautiful as the display picture, I set out needle in hand. My rose was somewhat less than perfect, but I persevered, and bit by bit I started to see the picture develop. 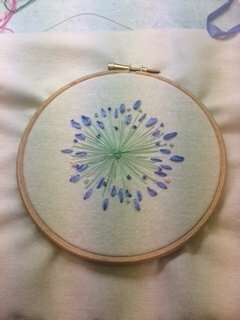 We were all so impressed at how quickly the design came together and by the end of the second day I had completed my topiary tree and was looking forward to starting my allium! Marilyn was a wonderful tutor and went above and beyond to help us all achieve a piece of work we would be proud to display. 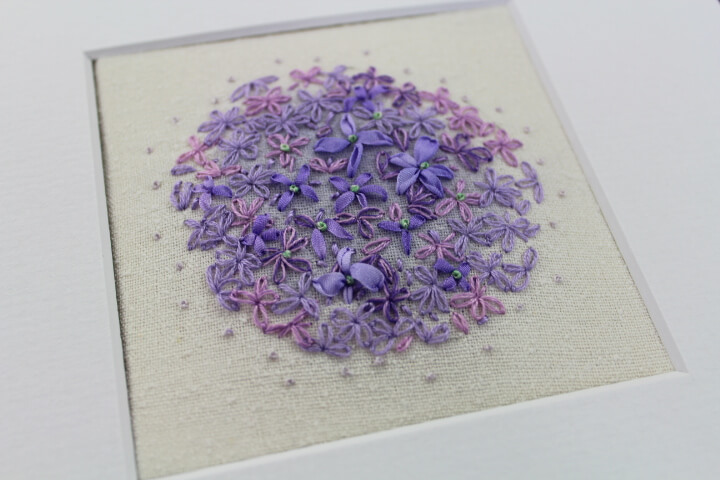 I loved my first taste of silk ribbon embroidery and can say confidently it won’t be my last course with Marilyn.